Firstly, my apologies for not attending the last SGE meeting and for submitting this written report late but you may be aware that in May I was appointed to a new position which has proved to be an exciting opportunity but also challenging and time consuming. The Conference was on many levels very successful and I was pleased to see Community delegates speaking on many debates, however, I was very disappointed that the NEC motion calling for a wholesale review of what UNISON does was defeated by conference. It is the 25th anniversary of the creation of UNISON and bearing in mind the huge (and ongoing) changes to our sector over the years, such a review is long overdue and delaying it by (hopefully until next NDC 2019) is at best a setback at worse an own goal. Especially for our Service Group but also for the whole union. While I understand the long and proud tradition of “platform bashing” at NDC (being suspicious and sceptical of everything and anything your elected lay NEC proposes) we cannot afford to put off accepting that our world has changed and we need to be prepared to make difficult decisions. In our Community Service Group world we desperately need change. We need to sort out how we fund and support our fragmented and diverse structures to make a process that will serve all branches with community members, whether or not they are Community specific, whether they are small, large, national or multi-employer branches. We need support for branch officers and understanding that facility time is difficult to obtain and often impossible for multi-employer branch activities. For such branches we need paid organisers to support workplace stewards and paid managers to supervise and support these paid workers. Those staff who are employed by branches deserve the same rights to effective line management and personal development that we would demand all employers to provide. All Community members deserve not only excellent advice and representation but also the opportunity to play a full part in the democracy of their union. Sadly, despite the fantastic work that our stewards and staff do day in and day out and the real difference they make to the member’s lives at work, too often neither happens. Let’s not wait until next NDC. Let’s start the debate now for Community, on what we need to organise effectively in 2018, work out what works and what doesn’t work and how we can pay for it. Let’s just do it! The General Secretary, Dave Prentis in his report to NEC passed on the thanks from the TUC for UNISON participation in the TUC demo not only for our numbers on the demo but for all the noise we made while marching. I spoke against a motion calling for a national conference for social care since Community members find it more difficult than some other service groups to get time off to attend motion based conferences than seminars. There had also been successful seminars for care workers and of course the whole point of National Delegate Conference, our annual Parliament, is to discuss such motions and decide upon campaigns. 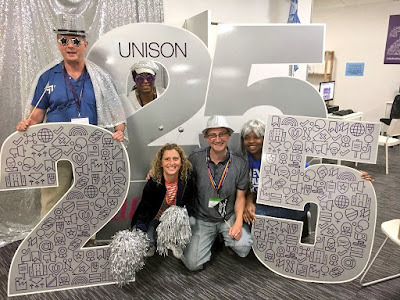 While I personally enjoy attending conferences UNISON holds a large number of expensive conferences already and I didn’t think that the case had been made to hold yet another. The NEC by a large majority decided to oppose this motion. On a motion calling for changes to branch funding I said that supporters of this proposal have to be honest about consequences since if we take money away and give it elsewhere then that will have to be paid for by, for example, sacking unison staff, closing regional centres, stopping our international work etc. As a NEC member I am also on the Policy & Development Subcommittee, Welfare Trustee, Staff Pension fund trustee and Vice Chair of the Industrial Action Committee. I am more than happy to discuss with SGE members or anyone from UNISON Community service group (Housing Associations and Voluntary sector) my work as their NEC member.